The following are the honorary degree citations and conferrals for William Cronon, Elaine Tuttle Hansen, Gary Hirshberg and Vivian Pinn, delivered at Commencement on May 26, 2013. President Spencer, I present William Cronon. “There is something Bunyanesque” about William Cronon’s stature within the academy, says fellow historian Kenneth Pomeranz of the University of Chicago. Bill Cronon is a Rhodes Scholar, Guggenheim Fellow, and recipient of a MacArthur genius award. He is the author of prize-winning books, including Changes in the Land, Nature’s Metropolis, and Uncommon Ground. His rigorous scholarship, imaginative arguments, and elegant prose break new ground in our understanding of nature, wilderness, and the American West. Twenty years ago, he left his full professorship at Yale, returning to his home state and the University of Wisconsin, drawn by his heart and by opportunities to serve the public good. Honorary degree recipient William Cronon and his Bates graduate son, Jeremy ’13, pose for a photograph after the ceremony. Photograph by Jose Leiva. 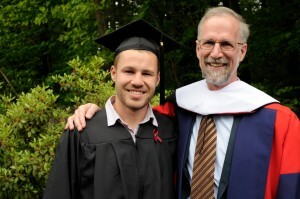 There are visible examples of this service, such as his presidency of the American Historical Association or his transformational leadership of his university’s undergraduate honors program. In 2011, Wisconsin and the nation witnessed his own power and wisdom. After he wrote a scholarly explanation of the partisan shift in Wisconsin politics, state operatives tried to intimidate him by demanding his email records. His subsequent defense of the principles of academic freedom showed more than a scholar and a citizen at work. It was the very model of the scholar as citizen. I present William Cronon for the degree Doctor of Letters. William Cronon, once a scholar wunderkind at Yale, now a scholar-citizen at home in Wisconsin, you put your heart and mind into telling the stories of our places and reminding us of the fundamental value of liberal learning. In your teaching, scholarship, and citizenship, you help to nurture human freedom in the service of human community. In so doing, you help us achieve the most powerful and generous form of human connection: the ability to love. Therefore, by the authority vested in me, I confer on you the degree of Doctor of Letters, with all the rights, privileges, and responsibilities thereunto appertaining. President Spencer, I present Elaine Tuttle Hansen. In 2002, into this league of extraordinary gentlemen, former presidents of Bates College, came this extraordinary woman. The first woman to lead Bates, she was also the first English scholar and the first native New Englander in more than a century. At her inauguration, she quoted our New England poet Emily Dickinson. Here at Bates, she said, we dwell in possibility. Possibility is ours because our purview is education: striving to help each individual realize his or her highest potential. Using an idea from the venerable writing teacher Peter Elbow, she asked us to make our plans for the future by engaging in the “believing game.” She invited our community to grapple with notions that might seem alien or contrary to us. 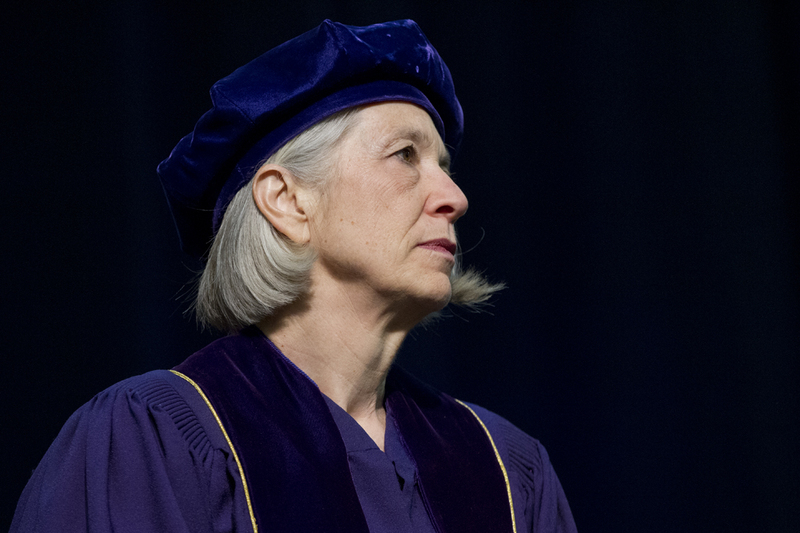 Through this alchemy of intellectual rigor and cooperative devotion, our best ideas became real, making Bates a stronger college during her presidency. Some of her results, some 450 strong, are before us. These poised and mindful seniors learned their lessons of liberal learning in new and transformed physical spaces that were envisioned and created during her presidency: Commons, Hedge and Roger Williams, Garcelon Field, Alumni Walk and 280 College Street. These seniors were supported by robust scholarships, by fine teaching, and by new and transformational programs for the arts, for diversity and inclusion, and for mathematics and natural sciences that were nourished by her leadership. Michael Bonney, chair of the Bates Board of Trustees, praised the skill and determination of her presidency, which was matched by her intellect, insight into higher education, and proven advocacy for diversity and intercultural understanding. Departing Bates in 2011, she continues to dwell in possibility. Executive director of the Johns Hopkins Center for Talented Youth, she dedicates herself to recognizing and developing the world’s brightest young minds. We would like to say that ours is the first honorary degree recognizing her Bates accomplishments. But our good friends at Morehouse College beat us to it, granting her an honorary degree last year. I present President Emerita of Bates College Elaine Tuttle Hansen for the degree Doctor of Letters. Elaine Tuttle Hansen, daughter of New England; scholar of broad range and distinction; seventh president of Bates College who helped us to dream well and take action on our good ideas — you stand tall before us, and we thank you, deeply and warmly, for your leadership. Therefore, by the authority vested in me, I hereby confer upon you the degree Doctor of Letters, with all the rights, privileges, and responsibilities thereunto appertaining. President Spencer, I present Gary Hirshberg. Years ago, Gary Hirshberg thought that the homemade pickles, beer and yogurt crafted on his friend’s New Hampshire farm tasted really great. So he and his friend decided to produce and sell one of these products. It wasn’t pickles or beer. It was yogurt, and under his leadership, Stonyfield Farm has become the largest organic yogurt producer in the world. His achievement is considered one of the great stories in the realm of sustainable and organic agribusiness, as is his success at making Stonyfield a model of corporate environmental consciousness. His is a forceful and upbeat voice in our national discourse about food and sustainability. His compelling appearance in the documentary Food Inc. helped to move that discussion into boardrooms and family dining rooms across the country. He uses his company’s economic power to serve the principles of environmental sustainability and effect positive change in the world. When Stonyfield wanted to support 180,000 acres of chemical-free agriculture in the Central Valley of California, he simply explained to farmers that if they went chem-free, then Stonyfield would buy their produce. He is chairman and founding partner of Just Label It, a national campaign to require companies to label genetically modified foods. His awards include a 2012 Lifetime Achievement Award from the U.S. Environmental Protection Agency and the 2012 Organic Leadership Award by the U.S. Organic Trade Association. He has received a Gordon Grand Fellowship from Yale, a program that promotes dialogue and understanding between business leaders and students. 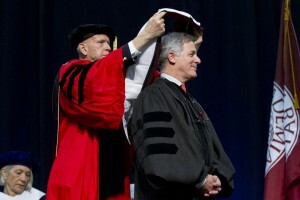 I present Gary Hirshberg for the degree Doctor of Humane Letters. Gary Hirshberg, you turned a simple dairy treat into big business, growing an organic yogurt operation until even Wal-Mart wanted a taste. By this great entrepreneurial feat, you got us all talking more about the food we eat, where it comes from, and whether it has been created by Mother Nature or by the scientist’s hand. Therefore, by the authority vested in me, I hereby confer upon you the degree Doctor of Humane Letters, with all the rights, privileges, and responsibilities thereunto appertaining. President Spencer, I present Dr. Vivian Pinn. 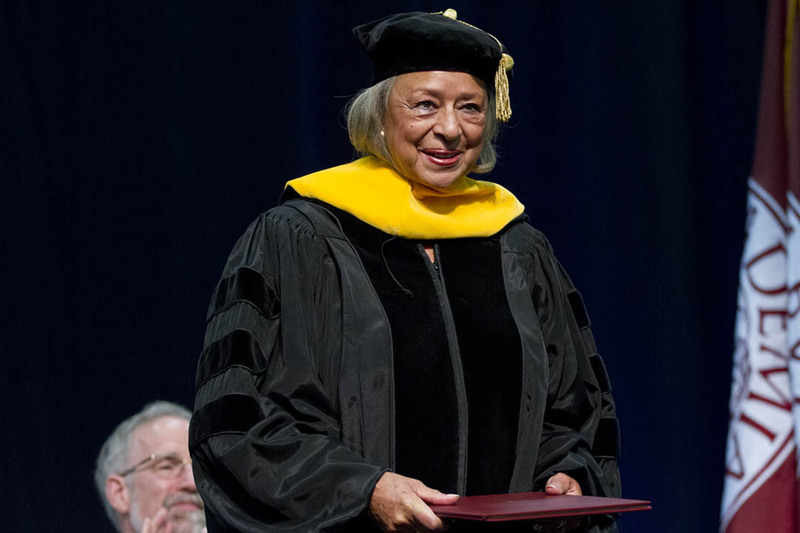 Vivian Pinn is a person of firsts and of singular achievements. Valedictorian of her high school class in Lynchburg, Virginia, she was one of only four black women in her class at Wellesley College. She was the only woman and the only minority student in her class to graduate from the University of Virginia School of Medicine. She was the first African American woman to chair an academic department of pathology, at Howard University College of Medicine. In the early 1990s, she was the first director of the Office of Research on Women’s Health at the National Institutes of Health. There, she led programs that advance the fair representation of women in medical research. She is a fellow of the American Academy of Arts and Sciences, a recipient of the Elizabeth Blackwell Award from the American Medical Women’s Association, and member of the Institute of Medicine. Witnessing adult relatives suffer fatal illnesses hardened her resolve to be a healer and to empower others to heal. I present Dr. Vivian W. Pinn for the degree Doctor of Science. Dr. Vivian Pinn, confronted by ailing bodies in a society rent by racism, you got up, determined to heal. Rising out of the segregated South, you were a one-woman force for integration and social justice. In medical practice and in research, you led America toward a fairer way. Assiduous in pursuit of education, you opened the path for those who came after. Therefore, by the authority vested in me, I hereby confer upon you the degree Doctor of Science, with all the rights, privileges, and responsibilities thereunto appertaining.